It seems perfectly natural to us that animation is a medium dominated by cel-by-cel drawings, whether made with paint and brush or mouse and software. But it might have been otherwise. After all, some animated films and videos have been made in less conventional formats with less conventional materials. In the past, we've featured here stop-motion animations made with dead bugs, innovative pinscreen animations, unusual cutout animations, and the "destructive animation" of painted plaster. And today, we bring you the live-action sand animation of Hungarian artist Ferenc Cakó, who projects his work on a screen for a theatrical audience. These more sculptural forms may be more painstaking than traditional cel animation, and for that reason more rare, but they are also often much more interesting. Cakó performs his "sand animations," all over the world, to the accompaniment of classical compositions like Bach's Orchestral Suite No. 3 in D major and Orff's Carmina Burana. Here we have his animated interpretation of the most well-known work of Vivaldi, the Four Seasons ("Spring" and "Summer" above, "Autumn" and "Winter" below.) The effect of Cakó's live technique is mesmerizing; his hands and arms break the fourth wall in broad gestures under which successions of images take shape. His sand drawings tend to be rather static—instead the animated elements in Cakó's sand animations are his hands as he pushes the sand around, rapidly forming it into faces, flocks of birds, angry clouds. These are quickly wiped away and remade into trees, frightened horses, solitary shepherds…. Watching him work raises many a question: Is Cakó using from storyboards? (No.) How much of his live animation does he improvise? (A good deal.) And why sand, anyway? (It's dry.) You will find more comprehensive answers to these questions and many more in an interview posted on Cakó's website. Alluding to the difficulty of his work, compounded by its performative aspect, Cakó says, "Sand cannot be corrected, so while working I do not have control, no motion control. I do not have any opportunity, which cartoonists do, such as the tracing paper phase, during which they either draw the lines or scan them in the computer." In other words, this is uniquely difficult art that requires the skills of a uniquely confident artist. Cakó's website also contains photos of the artist at work, a biography that is also a film-, art-, and performance-ography, and a page devoted specifically to scripting "the way Mr Cakó should be announced," complete with inexplicable uses of parentheses. It's a fitting bit of bravado for an artist who has legally copyrighted his process. 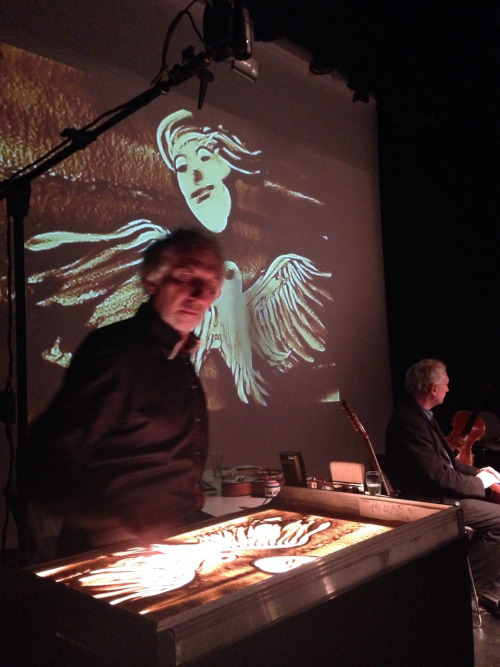 Live Sand Animation Performance, created by Mr Cako, right here by his hands, to the rhythm of the music. See many more "sandanimations"---and "paint animations"---at Cakó's YouTube channel. Thank you for sharing this! This was, without a doubt, one of the most beautiful experiences that I have partaken in.